The PeeNut is a new simple to use All in Two nappy system from Tots Bots, combining their one size soft and stretchy waterproof nappy cover (which can also be used independently as a wrap over nappies such as the Tots Bots Bamboozle) with the super absorbent layered PeeNut pads which popper in. 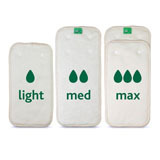 The PeeNut pads are made of bamboo viscose with microfibre interior (for quick absorbtion and speed of drying). The PeeNut pads are a 3-in-1 system, comprising a small and a large pad to use separately as required by poppering onto the PeeNut wrap, or to combine together to give greatest absorbtion. 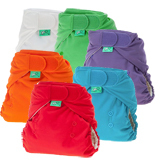 This therefore gives a great All in Two Nappy System, suitable from birth to potty training 7.7-33lb approx (3.5-15kg). (Note: Wraps and inserts also available separately, wraps also available in the smaller Size 1 to suit teeny babies). A great choice for out and about as this isn't a bulky system, as the extra PeeNut pads take up very little room in the changing bag.